I’m sure i’m not the first person to have come up with this, but I was so surprised it actually worked I thought I’d share…. 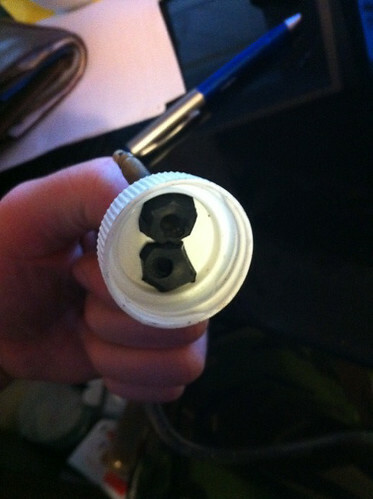 Some plastic tubing – 5-6mm internal diameter? 7 – Tyre inflates very quickly! Seems to work a treat – had to remove the valve core on one of my new high rollers but not the other one. Use said bottle as a dope rocket after, to celebrate….? Fortunately mine go up with a hand pump!!! 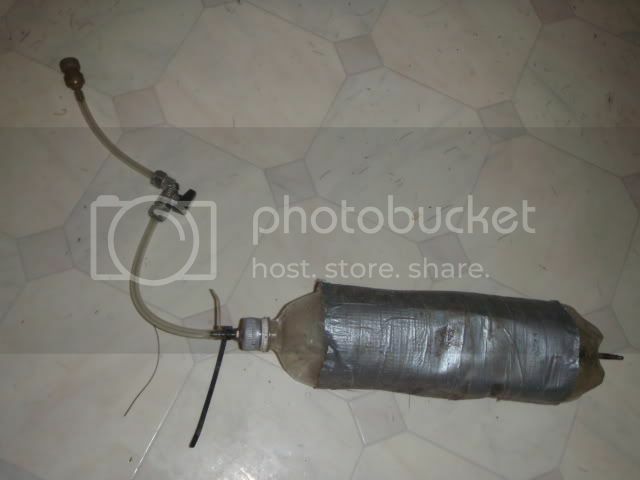 To be fair a 40psi bong would be er, interesting. EDIT: 40psi bong…!!!!!!! would beat buckets anyday of the week!!! I thought about this a while ago when I converted mine, but they went up with a track pump. Could use a 5l water bottle for more volume. Would probably need to tape that up as they’re square edged. Dunno if these would have gone up with a track pump – proabably with a bit of faff (stans rims after all). Decided i’d apply a bit of bodging rather than do the normal pump like a mental for 5 minutes whilst swearing. I’ve never ever had to resort to compressor help ……up till i helped a mate out to do his as “they are a piece of pith” furiously trying to pump with my track pump whilst he looked at me like “you said it was easy you fooktard” I concede defeat and 2 secs hooked up to my old mans compressor and they’re rock solid…. 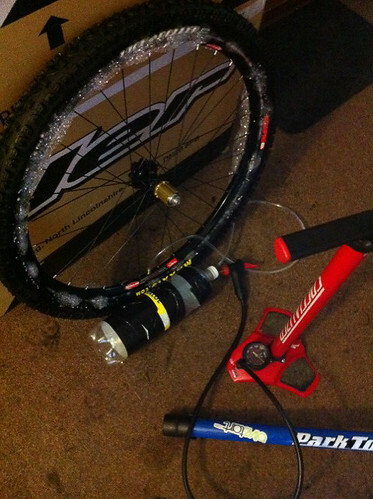 Will the pressure open the schrader valve to inflate the tubeless setup? Pressure should open the valve – if you’ve got 40psi in there. No idea whether it’d inflate quick enough – I only run tubless. You’d find it harder to bodge with schreder valves for the resivior. 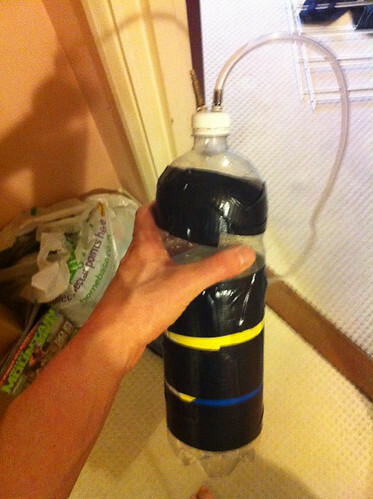 I made one of these a while ago for a few pounds (only differences: ball valve, pump adaptor, 3l bottle). It works so well I can’t believe no-one sells them (health and safety?). 3) fill the bottle with water first and pressure test well above what you plan to use it at (I pumped it up to 100psi but understand they normally fail above 150psi). Since water is incompressible it doesn’t store energy and so a failure won’t do any damage. 4) I’ve tied the valve assembly to the bottle in case the threads fail (to avoid high speed projectiles) and wrap it in a blanket in use. Spotted this thread last night after having trouble inflating my ghetto 29er wheels (for the first time ever, a track pump used to suffice, I guess the tyres have stretched? ), I went for Ewan’s method. Works an absolute treat, thanks. Could you acheive the same thing from a spare car wheel/tyre inflated to 40psi at the garage/by footpump – that would be a huge reservoir? Yup. All you’d need for that is a double-ended inflator hose. For tricky rims/tyres, this sounds great. Will try it. Looks cool, although I’ve always just used a track pump and had no problems. However, how much air could you fit in a normal 750ml water bottle? Do they leak? I’m thinking of a cheap, reusable, co2 cannister, that fits in a bottle cage on a road bike, and doesn’t look out of place. Would be weird if someone tried to drink out of it though. What’s the volume of a 700x23c tyre? wouldn;t it be easier just to carry a pump – you can use all the uncompressed air that’s freely available where you happen to have a puncture? how much air could you fit in a normal 750ml water bottle? I reckon about 0.75l. Just a guess. This is absolute genius! 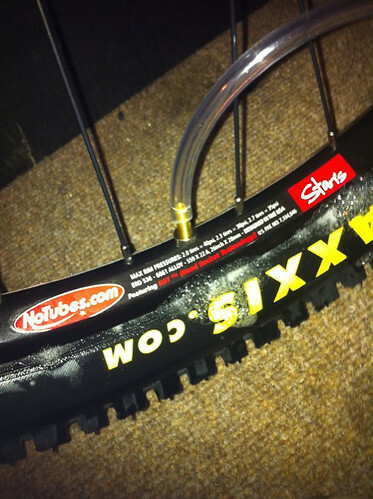 I’ve faffed around with tubeless for a couple of years using a track pump, often giving up in frustration and sticking a tube back in. Knocked up one of these and have just converted two wheels in under half an hour (stan’s flow and maxxis tyres.) Brilliant. Didn’t even bother with the soapy stuff. Big thanks to Ewan for posting this. where are you lots getting this tubing from? I’m tempted to try this, never had a problem with Crests and just a track pump but just switched to Arches and can’t get the same tyres to catch the air at all. DON’T PRESSURISE BOTTLES THAT AREN’T DESIGNED TO HOLD PRESSURE! FROM PERSONAL EXPERIENCE*, A FIZZY DRINKS BOTTLE CAN HANDLE ABOUT 150PSI**, BUT A ‘SQUASH’ BOTTLE CAN’T HANDLE VERY MUCH AT ALL. DON’T PRESSURISE ‘SQUASH’ BOTTLES, THEY CAN AND DO GO BANG. IN A LOUD AND SCARY WAY. Used an old coke bottle wrapped in gaffer tape, I may wrap it in a blanket next time just in case! Found that pumping to around 40psi was enough to do the job. 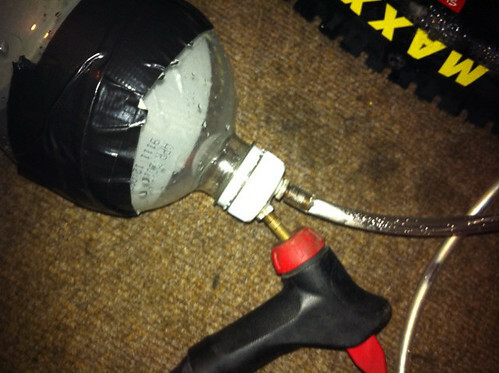 Bigjim, the tube I used to connect the valves was cut off the end of an injector thing that I had lying about that originally came with an expanding foam canisters from B&Q. ARE YOU SHOUTING BECAUSE YOU HAVE FOUND THIS OUT THE HARD WAY, & ARE NOW A BIT DEAF ?????? Seriously, I may try this method as for me its usually use a track pump, strike lucky & the tyre seats & inflates immediately, or it doesn’t & I end up going into work to use the compressor which is a no-no at the weekend & then i’ve to wait ’till Monday. So, yes, think i’ll give it a go. Where can I buy the tubing and a stop valve from? Unless you want to build a deluxe model then any old bit of tubing will do as long as it fits on the valve and that you can bend it to pinch it off. If you want one like aracer or totoro I’d search down my local DIY store’s plumbing aisle. I finaly got mine inflated (alex rims, maxxis tyres) by wraping electrical tape round and round and round the rim untill the tyre bead was actualy tight. Went up with a track pump (and not even a particularly big volume one) and added about 30g to the setup. Haha, I had a road tyre explode in the kitchen the other day, took me 30 seconds to realise that the radio hadn’t actualy turned off! excellent little trick. its certainly made them inflate fast enough, but i think the bottle top leaks a little bit and the tyres going down slowly afterwards. i might need to wait for it to be fully down, then get some pliers on the locknut for a better seal. I’d thought about doing this but this has solved a few issues I wasn’t sure about…. I’ve found an even better way to get your tyres to stay inflated, and with far less faffage! I know, I know. It’ll be all the rage next year….